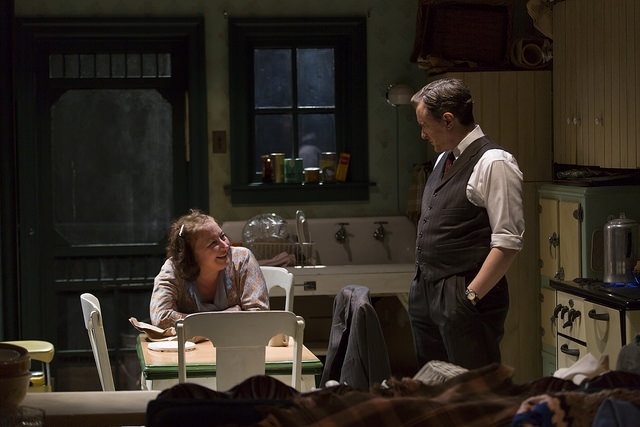 Adrianne Krstansky and Derek Hasenstab in the Huntington Theatre Company’s production of William Inge’s Come Back, Little Sheba, directed by David Cromer, playing March 27 – April 26, 2015, South End / Calderwood Pavilion at the BCA. Photo: T. Charles Erickson. BOSTON — A set is our doorway and entrance into a theatrical piece. It seems appropriate to mention right from the start the set designed by Stephen Dobay for the Huntington Theatre Company’s production of William Inge’s “Come Back, Little Sheba” at the Calderwood Pavilion of the Boston Center for the Arts because it is a perfect marriage of design with the vision of director David Cromer. The magnificently realized and detailed set — a front parlor that connects to a kitchen with a working gas stove and sink — will tell us so much about the circumstances of the characters before they even appear on stage. Inge intended the setting to be an old house in in a run-down neighborhood of a Midwestern city and the drab, worn home created by Dobay also allows for extensive action to be set offstage left and right. Dobay and Cromer take full advantage of the versatility of the Roberts Studio Theatre, Cromer for the second time after his award-winning production of “Our Town” for the Huntington in 2012. The audience is seated on two sides, allowing for the length and breadth of Dobay’s set. It is 1949 and the youthful good looks that once enabled Lola Delaney (Adrianne Krstansky), now 40, to beat out the other girls for the affections of husband Doc Delaney (Derek Hasenstab), are long gone. Lola is overweight and unkempt and at this point in her life she is starving for affection and attention, and it doesn’t really matter where it comes from: a friendly postman (Adam Zahler), a muscle-flexing milkman (Michael Knowlton) or her German-American neighbor, Mrs. Coffman (Maureen Keiller), herself busy with a large family and constantly rebuffing Lola’s offers of a cup of coffee. In those times Lola still hopes that a spark will emerge that will re-kindle their marriage, that Doc, a recovering alcoholic, will continue to stay on the straight and narrow and their circumstances will improve. The cramped home has been made even more cramped by the couple’s financial decision to rent out their dining room as a bedroom for vivacious young college student named Marie (Marie Polizzano), whom Doc dotes on as he serves her breakfast. Max Carpenter and Adrianne Krstansky in the Huntington Theatre Company’s Come Back, Little Sheba plays March 27 — April 26, 2015 at the South End / Calderwood Pavilion at the BCA. Photo: T. Charles Erickson. But there are icebergs simmering just beneath the surface. Doc’s dreams have died hard, one by one, and Lola continues to call for her beloved dog Little Sheba long after it disappeared. Doc, it turns out, isn’t quite an M.D., having had to drop out of medical school to pursue a career as a chiropractor when he got Lola pregnant and felt obligated to marry her. The baby died shortly after birth, and 20 years later, the marriage is still intact chiefly because neither one seems to have any other place to go. Both take a voyeuristic interest — perhaps an unhealthy interest, in Doc’s case — in the love lives of Marie and her hunky boyfriend Turk (Max Carpenter), perhaps realizing what they once had has been lost, perhaps irretrievably. Doc is a ticking time bomb, and when he finally goers off, the explosion is both horrifying and riveting, a car crash it is impossible to turn away from. But slowly he regains control, and it becomes apparent that Lola and Doc will stay together and try and pick up the pieces. Lola notes hopefully that she has stopped calling for Little Sheba. Cromer showed us here and in “Our Town” the feel he has for creating intimate, powerful theatrical experiences, and coaxing strong performances across the board. And Inge has shown us what happens when our dreams die hard, when circumstances and fate combine to put a stranglehold on our attempts to find happiness. It is a harrowing portrait, and one that will stay with you. The Huntington Theatre Company of “Come Back, Little Sheba.” Written by William Inge. Directed by David Cromer; Scenic Design, Stephen Dobay; Costume Design, Sarah Laux; Lighting Design, Mike Durst; Sound Design,Jonathan Mastro; Production Stage Manager, Kevin Schlagle; Deck Supervisor, Jess Wolf; Performed through April 26 at the Calderwood Pavilion, Boston Center for the Arts, 527 Tremont St., Boston; $25 and up; huntingtontheatre.org; 617-266-0800.